Eamon McCarthy Earls (EME) and I (FM) sat down at Panera Bread to talk about his candidacy for the Franklin (MA) Town Council in the election scheduled for Nov 7, 2017. FM - Tell me a bit about yourself, your family, and your life here in Franklin? What is your Franklin story? EME - I grew up in Franklin, attended public schools here and graduated from Franklin High School. My family lives in Franklin and I have many friends throughout the town. Growing up here, I became interested in our community's history from talking with lifelong residents such as Stella Jeon, or Howard and Sandy Crawford. I was inspired by their stories to research and write a history of the town from colonial times to the present day that I published in 2012. Today, I'm also a homeowner in Franklin, invested in our town's future and committed to seeing this community thrive. FM - What experience or background will help you to serve in this role? What do you bring to the table that helps to set you apart from the others? EME - I am well prepared for our complex financial and environmental challenges with an MBA and a bachelors degree in geology from UMASS-Amherst. 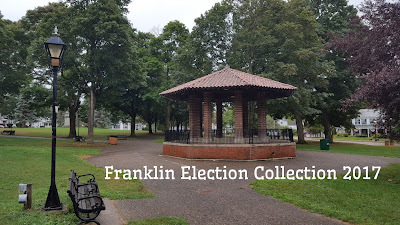 Town Council is a new way to serve my town, building on the work that I did as an Associate member of the Franklin Historical Commission, helping to set up the Town Museum in 2010, that now anchors our Cultural District. In addition, I've had other longstanding involvements in town whether collecting used bicycles or supporting the Charles River meadowlands initiative. FM - What do you see as your role's biggest challenge and do you have any suggestions on how we can resolve it? EME - Engaging the public is one of the biggest challenges, which requires active outreach on the part of the Council. Councilors complain that nobody cares so they just do what they want. I want to encourage a more active citizenry and more people getting involved in our community. More transparency is needed so that citizens can find the services they need, express their concerns and participate. Some of this can be accomplished through new technology, even potentially apps. But above all, councilors need to be out talking to citizens and not just a select few. FM - As you know, Franklin has applied to the state for an official Cultural District designation in town. What do you feel is the role of arts and culture in Franklin, and what is your plan to advance that agenda? EME - It's a great opportunity to invigorate the downtown as a destination for residents and for visitors from out of town. The exact shape of it will evolve overtime, but between the town museum, our historic library and the resources of Dean College as well the Franklin Art Association we have a great foundation. It's both an economic development opportunity and a chance to increase the quality of life for residents through new opportunities for visual arts, performing arts. Our existing town codes could be seen as blocking the creation of certain art galleries and antiques businesses that might otherwise be a great element in a cultural district. FM - Would you like to add a closing statement? EME - All of the people on the council boast about the same things, bringing in business, reducing taxes, almost the same line the entire time. With the 250th anniversary of the town coming up, it's time to take stock and see if we have the right mix of business and how it may evolve over coming years with the changing demographics of the town. Will the town grow in a way that matches its schools and infrastructure? What are we doing to understand and manage that for the long term. Some of the approaches have tended to be tactical, bringing in specific employers or dealing with the problems of a single property. Active town council that shapes the long term agenda. It's not clear exactly how long it will take to clean up our Superfund site and finally get some closure on our polluted Grove St. brownfields. Clearly there are public health challenges too, the continued challenges of opiods and the growing threat from new tick-borne illnesses. We should be making sure that our local public health infrastructure and schools are equipped to deal with these things. As a town councilor, I will rise to meet these challenges and work to make the Council a transparent, responsive and engaged group that talks to citizens and works closely with other parts of town government such as the School Committee. Eamon's email address is eamon4newftc@gmail.com and his campaign Facebook page is @eamon4newftc. Noteworthy: This information is intended to help the Franklin voters when we all head to the ballot box on November 7. The interview candidates have had an opportunity to review the text before publishing to ensure the accuracy of our discussion. “Families these days want families activities"